The polymer-controlled and bioinspired precipitation of inorganic minerals from aqueous solution at near-ambient or physiological conditions avoiding high temperatures or organic solvents is a key research area in materials science. Polymer-controlled mineralization has been studied as a model for biomineralization and for the synthesis of (bioinspired and biocompatible) hybrid materials for a virtually unlimited number of applications. Calcium phosphate mineralization is of particular interest for bone and dental repair. Numerous studies have therefore addressed the mineralization of calcium phosphate using a wide variety of low- and high-molecular-weight additives. 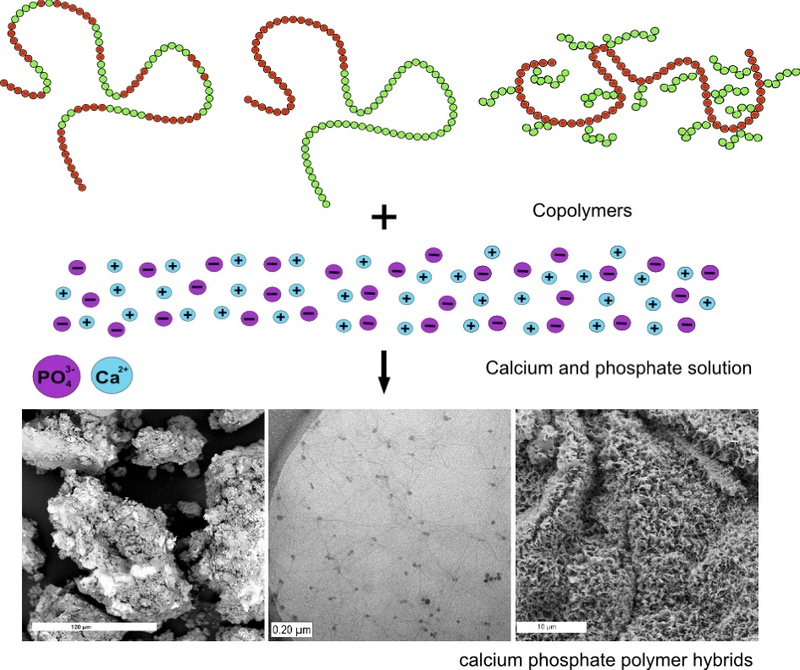 In spite of the growing interest and increasing number of experimental and theoretical data, the mechanisms of polymer-controlled calcium phosphate mineralization are not entirely clear to date, although the field has made significant progress in the last years. A set of elegant experiments and calculations has shed light on some details of mineral formation, but it is currently not possible to preprogram a mineralization reaction to yield a desired product for a specific application. The current article therefore summarizes and discusses the influence of (macro)molecular entities such as polymers, peptides, proteins and gels on biomimetic calcium phosphate mineralization from aqueous solution. It focuses on strategies to tune the kinetics, morphologies, final dimensions and crystal phases of calcium phosphate, as well as on mechanistic considerations.